Affinity purified against recombinant protein GST- SHARPIN [DU 32976] and then depleted against GST. HEK293-ILIR cells were incubated without or with IL-Ibeta and SHARPIN was precipitated from 3 mg cell lysates using immunobilised NEMP (IKK gamma), which captures linear and Lys63-linked ubiquitin chains. Eluted proteins were subjected to SDS-Page before being immunoblotted with anti-SHARPIN. 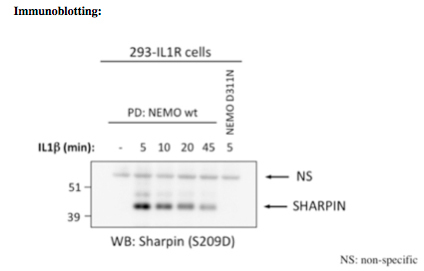 The results show that NEMO captures SHARPIN only in IL1-stimulated cells. SHARPIN was not captured, when NEMO was replaced by the polyubiquitin-binding defective mutants NEMO D311N. 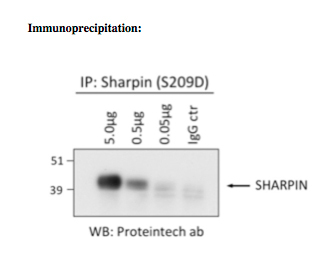 SHARPIN was immunoprecipitated from HeLa total cell extracts (1 mg) using various amounts of anti-SHARPIN S209D before being immunoblotted with anti-HOIP (Proteintech 14626-1-AP). Activation of the canonical IKK complex by K63/M1-linked hybrid ubiquitin chains.